In 2014 I went to France for an international conference. Being a poor graduate student, when I bought my ticket, I went with the cheapest option available – Iberia Airlines, flying into Charles De Gaulle. At the time, I had no idea that they were about to go bankrupt, and go out of business. So, lucky me, the airline got bought by British Airways, which is how I ended up flying on a really sweet airline for half the price. The only twist was that I was now flying into Paris Orly, a smaller airport to the south of Paris. I wish I could call this a travel tip, but short of basically insider trading I don’t know how I could set this situation up a second time. Let’s get fancy! Oui oui! 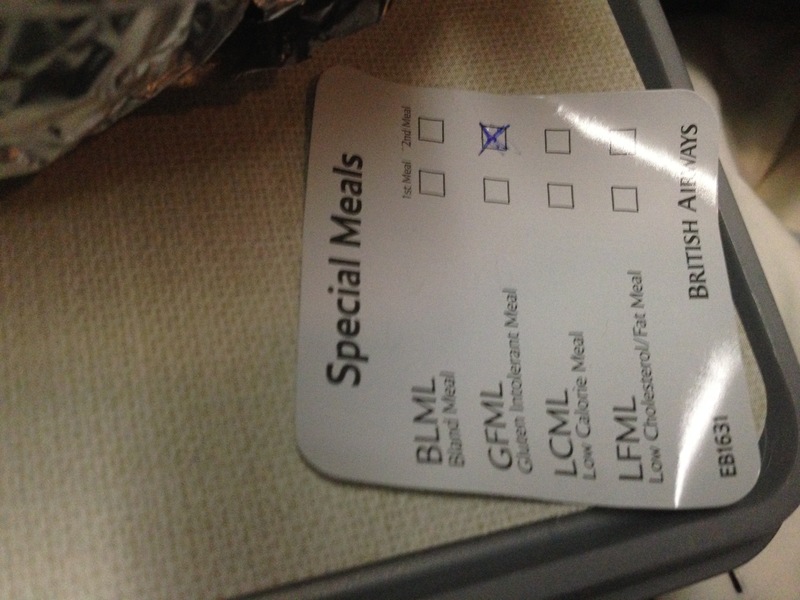 So I called British Airways a week before my flight to be sure they had a gluten free meal coming on board with me, and got ready to go! Getting onto the plane was pretty uneventful, short of my excitement about how proper literally everything sounded since the staff for the flight were all British. 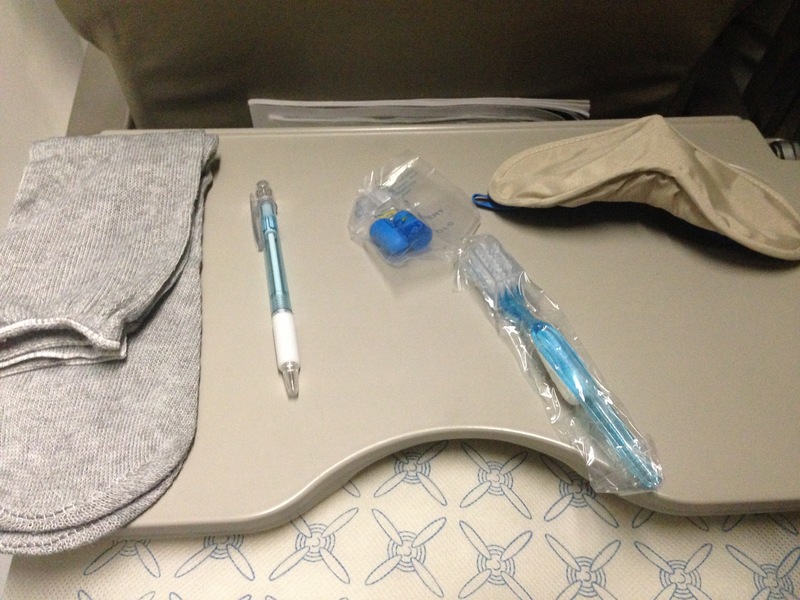 I sat near the back of the plane, had plenty of space to stow my things, and was surprised to find a package on each seat, with socks, a toothbrush, earplugs, eye mask, and pencil. 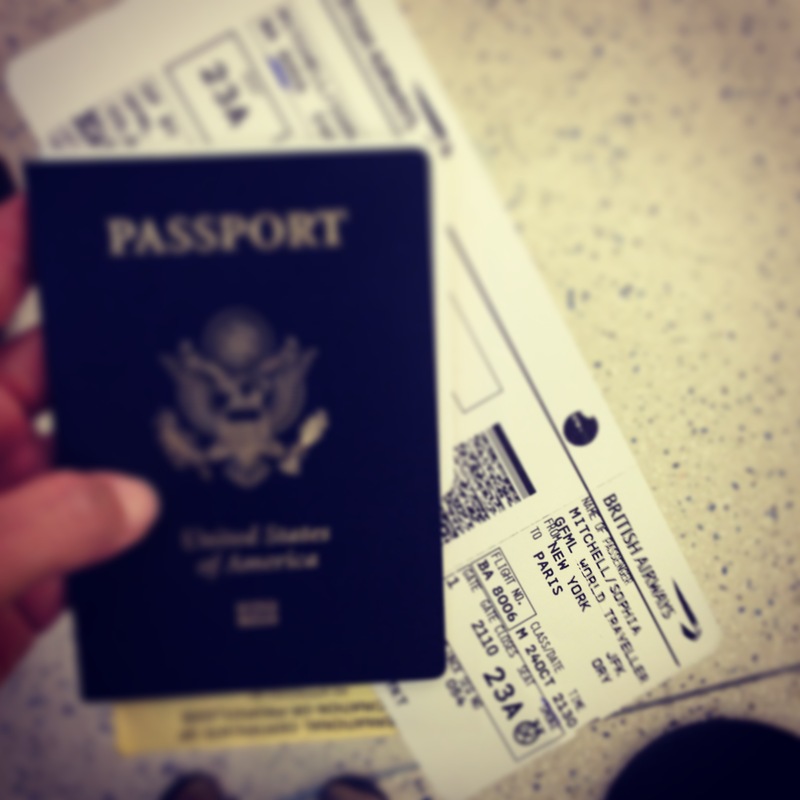 Finally it was time to settle in for the journey from New York to Paris. 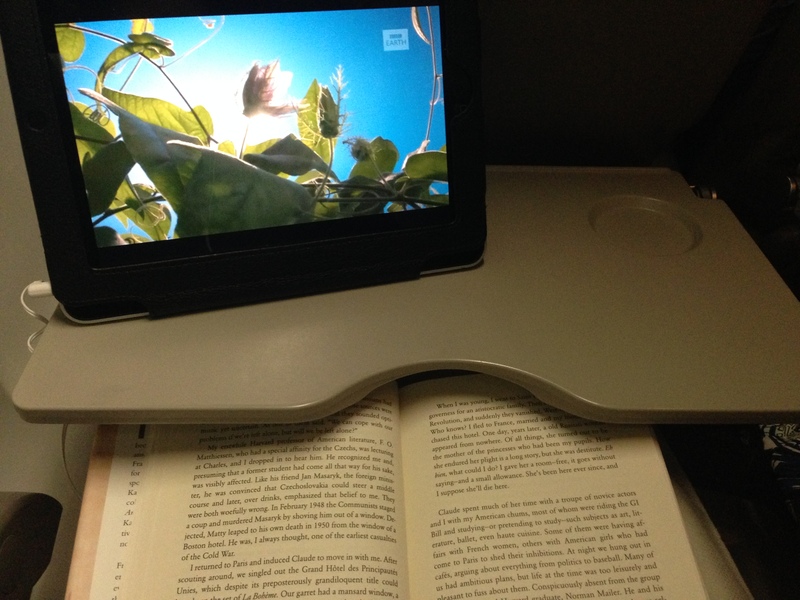 Once we got up to cruising altitude, the flight attendants came around with a cart full of charged complimentary iPads for everyone to use during the flight. It was really neat, as they had pre-installed games, movies, music and tv shows. They also had these nature shows with relaxing pictures, outdoor sounds and soft music. I opted to play one of those while I read in my seat for the first hour or so. A couple hours into our flight it was dinnertime. I was a bit anxious to see if they had remembered my gluten free needs, but sure enough the flight attendant came through the cabin first with special meals before delivering the rest of the food. I double checked the tag to be sure My gluten free dinner: rice cakes + butter, salad + gf dressing, fruit, chicken and roasted veggies, and a small bottle of complimentary white wine. 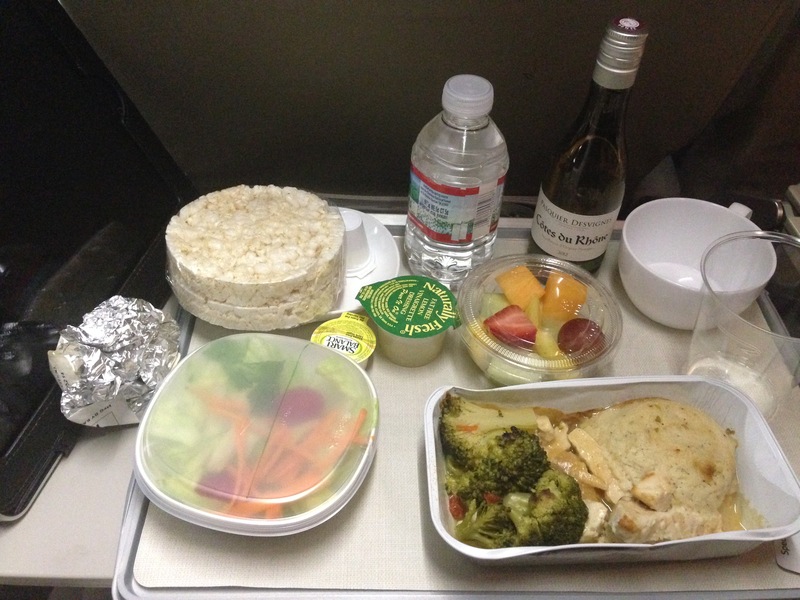 Pretty decent for an in-flight meal! Filled me up, and I was ready to drift off to sleep. Several hours later, I woke up to the sun making its way over the Atlantic. I checked the iPad which said we were somewhere over the far northern Atlantic, about to fly over the British isles. I brushed my teeth, read, and was given tea and some fruit for breakfast. The gluten free option here wasn’t as extensive, but I don’t usually eat as much for breakfast, so I was still satisfied. Note: the top of the fruit bowl has a “GF” on it – seems everything is planned out and kept separate. Yay! And that’s it for British Airways! 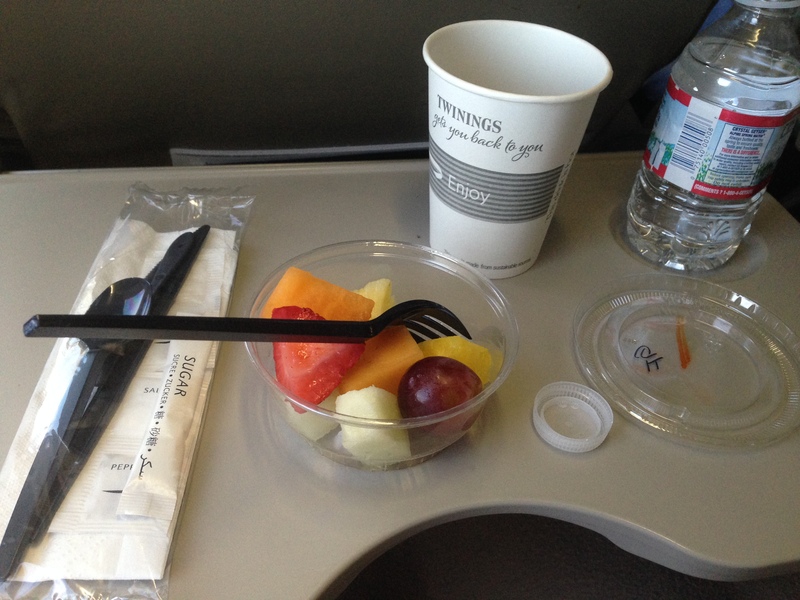 Overall it was fine for airline food. Things were clearly labeled and had been kept separately, and I wasn’t hungry. Mission accomplished. How are you not following this blog? Sign up to be emailed new content!